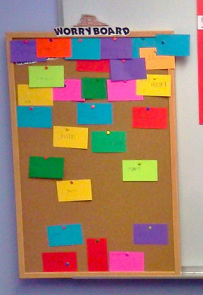 The Worry Board is a quick and easy way to visually track issues from week to week. First I ask the child to write their first name on one side of an index card. If they are very concerned about privacy, they can use their initials or an alias instead. On the other side, I ask them to write their biggest worry or problem of the week. This is interesting, because sometimes they're worried about something I hadn't thought of. If a kid says he doesn't have a worry, I point out that everybody has worries (even me!). I also might joke, "Well then I guess you can go back to class since you don't need me this week." That almost always gets their juices going! I'm perfectly comfortable asking outright if they're worried about a particular issue if they don't bring it up first. Next, I tell them that where they pin the index card on the board will show me how big that worry or problem is. If it's at the very top, it's huge. A bit lower is really big. In the middle is medium-sized, and as we get down towards the bottom, the worry is quite small. You get the idea. Then next week, we'll check the card and see if that issue is still a worry. If it is, we'll see if it's gotten bigger, smaller, or stayed the same. If it's no longer a worry I let them tear up the card and throw it in the recycling bin. Kids really like it when they see that everybody who comes to see me has worries or problems. It helps them to feel less alone. Just be sure to let them know that people's worries are private. They are absolutely not allowed to look at anyone else's worry, just as I will not let anyone else look at theirs. A final statement is beneficial, especially for kids who are quite literal. I tell them that they will be leaving their worry on the board so they won't have to carry it around with them any more. In my old school I used to have an entire Worry Wall, but couldn't do that in my new office. The bulletin board worked fine except that it got awfully crowded at the top. Shortly after I took this photo, the top of the board was about four cards deep and it was hard for kids to find their worry in subsequent weeks. I might try the back of my door next year.